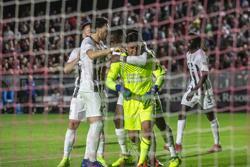 Phoenix, Arizona (March 30, 2019) – The Colorado Springs Switchbacks FC earned a hard-fought draw on the road against the Phoenix Rising FC 2-2 on Saturday behind Abraham Rodriguez's 11 saves on the night. Coming off of the late 1-0 win over San Antonio FC on March 23rd, the Switchbacks were looking to carry that momentum on the road trip to Phoenix. The Switchbacks got on the board first when Jordan Burt finished a deflected shot from Matt Hundley in the 26th minute. The Switchbacks 16-year-old goalkeeper, Abraham Rodriguez, made a double save to deny Phoenix just a minute later. Just moments before halftime, Phoenix found their equalizer from a corner kick when Joseph Farrell's header deflected off the crossbar and over the goal line. Phoenix came out firing in the second half but Rodriguez was up to every shot that came his way, including Solomon Asante's penalty kick when Rodriguez read the direction of the shot and made a strong save to keep the scoreline 1-1 in the 79th minute. Phoenix found a go-ahead goal in the 86th minute from an Adam Jahn diving header. But the late drama continued all the way into the first minute of stoppage time when Ish Jome scored from a free kick to earn the Switchbacks a hard-fought draw on the road.